For example, a party geared with ice weapons and critical hit abilities, may be able to autopilot against a few Fire Giants, but may have issues against a trash mob while exploring Gelidia. And in that latter scenario, the player needs to be able figure out a way to get through that battle. In that example, the party could go back to the Adventurer's Guild. Either by walking, teleporting, or if all else fails loading a previous save. Then they can grab appropriate equipment from their stash. In addition they should be allowed to add/remove characters/monsters to and from the party. In addition they should be allowed to add/remove characters/monsters to and from the party. That could be neat. I wouldn't mind being able to stable stray Slath-Beast that my party picked up during its travels; and be able to sell it, or come back for it later. If it's like the originals, you can. I actually did this replaying bt 1 recently. The issue is that it takes more grinding since you're dividing the experience among more characters. It's actually a function best used in a small party set up, which I discovered when I joined this forum is a very unpopular concept. For summons/specials, I would prefer that they be temporary in the first place. Ie the Wizard summons the creature who fights for you for x number of turns. It would have expanded the spell book greatly in bt1, and actually make the summoning function (which is the crux of the Wizard class) relevant in 2 & 3. And I still like Deathstrike as a Wizard spell, not a Magician; the Wizard summons Death herself for one turn to target one unfortunate monster. One of my earliest plays at Bard's Tale 2 saw my level one party enter the Dark Domain, and encounter an amicable SlatherBeast; join the party? SURE! It tore everything apart that crossed our path, and very fun to have along... But lest someone think that's an unbalance exploit, recall that it's a calculated gamble, because that beast can decide it doesn't like the party anymore, and eat the lot of them—which it did. **Temple of Elemental Evil had a bit of this feature. NPCs could (at times) decide to become enemies; also certain monster NPCs existed, you could recruit a giant... but the town wouldn't let you in with him in your party. I think this could work in a BT sequel; especially if the Bard had to return to town regularly (one would hope). I actually have a similar story, as for some reason early in BT2 (C64 version) I took my imported party into the Destiny Stone, and used the Spectre Snare to snare a Mike's Golem. That guy tore things apart for a long time. Forget when/why I decided to replace him with another party member; I think it was because I got sick of him turning on me. I also wondered how my Level 25 party actually survived an encounter with him, because every encounter with them later in the game with a Level 50 party resulted in me being pummeled unmercifully. What I'm curious about is if all this discussion is being read by dev staffers or being passed on to devs for absorption into their creation proces...? Yes, as have many comments and threads through the years. By contrast, a lot of level-appropriate fights would be quite risky without resorting to magic. People who want each and every fight to be interesting without being challenging are maybe looking for a toy more than a game. Indeed. To say nothing of going in when underleveled. Frankly, much of the challenge in 3 was seeing how soon you could go into a dungeon without being brutalized. Furthermore, the relative simplicity of combat meant that combat could be viewed as a whole, as opposed to just each individual fight. It'd like the old "won the battle, lost the war" cliche. Sure, you might only lose a few HP and a couple SpPts in that fight. But after the thirtieth fight, those loses add up. Yeah, you next fight might be against a single Reaver and you can burn through it each. But it might be against 30 Shade Dogs and they're going to eat your half-dead party. It was never about the strategy in fighting a single group of random encounter foes. It was about resource management across numerous encounters in succession. When each fight involves enemy juggling and buff/debuff management and meditation and item use and all that stuff, all the focus is on the individual fight. Now, having all of that stuff for bosses or rare battles? Sure. That's interesting. But doing that for five goblins sounds absolutely dreadful. Hmm, finding and spellbinding a mimic, sounds fun. Although finding a mimic in the first place is very rare and scary as hell. I think it's an important part of BT that the party can recruit monsters like in the classics: Wandering monsters sometimes offer to join, or party members can use spells to force opponents to join. This is something really unique to BT (a signature element, if you like) as opposed to other titles of renown. Drool I agree, you are rightfully worried about the combat. They are going for a more cinematic experience, as we can see from their video. Although i'm sure there will be very quick trash fights in the game as well, the general scale of the combat will be much smaller. Especially if we take into consideration "visible" encounters, where monsters gets a small introduction "cinematic". It doesn't add up. Now about that skull-cleaving you've mentioned earlier, I'm curious about how bloody the game will be. 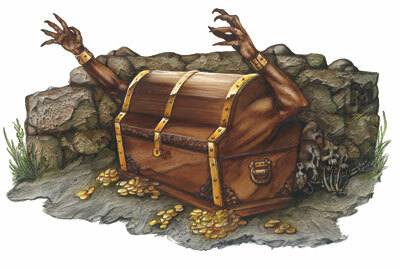 Although finding a mimic in the first place is very rare and scary as hell. "Legend of Grimrock" first accustomed the player to opening chests by peeking into the box as it opens; up-close-and-personal. Then later in the game, started adding mimics, and the chest would open up to reveal a toothy maw that had people jumping out of their seats. It was never about the strategy in fighting a single group of random encounter foes. It was about resource management across numerous encounters in succession. When each fight involves enemy juggling and buff/debuff management and meditation and item use and all that stuff, all the focus is on the individual fight. As much as we might want different things at the battle level, I wholeheartedly agree with you there. One of the primary things I liked in BT1 was having to manage your party resources over a whole dungeon dive. Since then, RPGs have been moving ever more towards "insta-regen", which I loathe. Many players want to meet every encounter at full strength, unload all they've got in a massive blaze of glory, regenerate, and repeat. To me, that ruins the sense of adventure and having to make strategic choices about when to use powerful but resource-expensive abilities. Long term resources make even the small encounters meaningful, because now they have a cost. It also makes me think about when it's time to turn around and head back when I'm exploring a new, dangerous area. (I still want both things though: tactically deep combats I can finish more efficiently with creative strategies, and long term management). I wonder if we have any chance of getting a long term dynamic. I'm afraid it'd be tough in a commercial sense. Players seem to expect games will prevent them from ever backing themselves into a resource starvation corner that leads to inevitable party death, where to me, a game that doesn't let me back myself into a corner isn't nearly as fun. I want the freedom to fail. Related: one of the developers stated in an update that they want to allow you to get to places you shouldn't, and have the "learning experience" of a drubbing by things much meaner than you. Cheers to that! Too many games use level-gated areas to hold my hand, dole out encounters in carefully measured doses, and ensure I never get in over my head. But much like with resource management, I want the game to let me get in over my head. I have a terrible feeling that BT4 is gonna go full-casual and get rid of limited resource management of SP/HP in favor of regen-over-time and cooldowns. They didn't do this in WL2 but there was some backlash from players who didn't like having to manage to medical items etc. That would be disappointing, to be sure. Same thing IMO, if they made visiting the town optional for party's with a Bard. **BTW: I'd have nothing against a magical site that allowed portal travel—even to town; so long as they are not utterly commonplace. but a Town-Portal spell (like Diablo & Titan Quest) is a bad idea IMO. Characters should be able to run out of resources, and have to survive the retreat. I have a terrible feeling that BT4 is gonna go full-casual and get rid of limited resource management of SP/HP in favor of regen-over-time and cooldowns. Yeah, we'll have to see. Even Obsidian's Deadfire seems to be backing away, which makes me sad. That's also a non-mainstream, less casual-player-friendly dynamic, and one I like (as long as it isn't purely trial and error based - the game can guide me, but shouldn't compel me). I like games that let me explore and possibly get myself in deep trouble. If BT4 is willing to buck the mainstream there, who knows, maybe it also might around long term resources. Last edited by Gizmo on September 17th, 2017, 4:46 pm, edited 1 time in total. I dunno, from the last video update, it seems like InXile actually believe that them keeping it turn-based and grid-based is a HUGE concession to the old-school fans or something, like they actually considered making it real-time or something. I just think that BT fans think there's a bit more to a "BT game" than turn/phase-based combat and grid movement, there's much, much more. I'd say it is, and that that would be perhaps the most obvious focal point of contention if they omitted it. It's already bad enough that they made it optional; let's hope that they don't make the turn based part of it optional as well. I'd have nothing against a magical site that allowed portal travel—even to town; so long as they are not utterly commonplace. but a Town-Portal spell (like Diablo & Titan Quest) is a bad idea IMO. How about a town portal spell (like Bard's Tale 2, SASP) which removes all of the party's gold? I have used it on several occassions, because BT2 was the toughest of the lot, in my opinion. Apport Arcane is also a signature Bard's Tale spell, where one can enter X, Y, Z coordinates for advanced teleportation, I hope it will find its use in BT4. In addition, well-placed fountains of health, mana, youth (and other less helpful ones) are a nice option, especially in hidden, secret areas, where creative use of PHDO and APAR are necessary to reach them. Previously, we have talked about whether it is better to do something in a half-hearted way, or not at all. From the backer updates (slim as they are), I get the feeling they did both the phase-based combat and the grid based exploration in such a way. We have focus points, nodes and whatnot, indeed if they think this is what made the Bard's Tale the Bard's Tale, they're very wrong. Apport Arcane is also a signature Bard's Tale spell, where one can enter X, Y, Z coordinates for advanced teleportation, I hope it will find its use in BT4. Teleport is tricky. I would love a high-level teleport spell, though it can certainly be used to circumvent traps and puzzles. I remember a friend of mine was playing BG2, in Durlag's Tower (IRRC), and there was this room he was stuck in. Every time he entered the door would snap shut after he grabbed the loot and was too far to make it back to it in time... I sat down, and tried it. I sent his mage in alone and grabbed the loot, and teleported out to the other side of the door (in time, before it shut— you can't teleport through walls); this was not supposed to be possible, it was an oversight on the developer's part. In Grimrock teleport would be a real headache. Many, many traps and puzzles rely on the party not being able to instantly traverse distance or pits, or change elevation at whim. BT4 would definitely need the anti-magic zones to protect certain areas from trivial defeat; and that might become a designer's crutch. In the original BTs the player could not see the population of the cells ahead, in BT4 they most certainly can. That makes a teleport spell useful to bypass encounters; perhaps even fixed encounters. They designers would have to be very careful about including teleport; but it'd be nice if that can.